Get It Scrapped is 5 years old. To celebrate, we’ve planned a 5-week series of giveaways. And this one is the last! We’re giving away (2) $50 gift cards from Etsy.com and (2) MSD 2013 memberships. Entry opens Weds, May 8 and closes Sunday, May 12 at 3 am ET. Scroll down and enter with a simple click. Earn more entries with blog post comments, tweets, and more. We are wrapping up our 5-year anniversary celebration on Mother’s Day and have a limited-time awesome offer. The Top 10 issue of MSD is only available as a part of a 6-month or 12-month membership — except for these 4 days: grab it before May 12th for $18. Click here for more details. Grab it by May 12 – which is soon! Mostly my point and shoot – would love a DSLR – hasn’t been in the budget – I’m using my phone more and more…especially now that it is linked to dropbox…SWEET! Thanks for the opportunity. I use my DSLR the most! Love the results! I have leftovers from several projects on my desk. need to clean! My desk is a mess!! It seems to be the spot where all the household papers collect. Right now I am working on trying to fix some mediocre pictures from Disney On Ice, so I can scrap them. 2 weeks of PL layouts. I had company and have been sick, but getting it done this weekend! Santa was very generous and bought me a Sony Nex 6. So far I am happy wit the results. Once I learn more I know I will love it. On my scrap desk is PL spreads and school supplies to start on my daughter’s pre school album. Thanks for a chance to win. A stack of my daughters photos from her trip to Erurope last year, we are getting ready to pull papers! Thanks for the chance to win. I am working on pages for Layout a Day (LOAD) – doing mostly digital so on my “virtual desk” I am sorting and tagging photos that are stuck in the “not in any folder” category. On my physical desk are some new dies that I want to try before I put them away. I’m starting back at beginning to create albums for my kids from birth – so 5 years of photos! Thanks for the great chance! Nothing on my desk at the moment except for a cutting mat – I don’t have a scraproom so I need to keep my little corner clean because it’s part of our bedroom. But lots of ideas – I’ve got a mixed-media background waiting for my next scrappy session, I’ll probably pair it up with a cruise photo. You can’t see my desk since it’s covered with items I’m using to make my own embellishments. I’m working on a layout and a card. My desk is always covered with scraps, papers, scissors, tape guns etc. I have a few photos of my son as an infant that I want to use with one of the Coaching Lessons from 2×2. I just have some leftovers from my last layout on my desk. The leftover scraps from my layout for LOAD last night. My computer, a Diet Coke, my camera, EHD x 3 and my phone :). Thanks for the chance! Remnants of an unfinished project. A gift for a friend that I keep trying to complete! Loads of unfinished layouts from a crop and stash that needs to be put away. I am working on pictures from our trip to Mexico for our nieces wedding. I have several desk/work surfaces and they all seem to be covered with something on the go all the time. Right now I’m finishing Mother’s Day cards for my mom & 3 sisters. I’m finishing up a small book for my preschool class as end of year gifts. I’m close to finishing my December daily album from last Christmas. Sorting through my digital scrapbooking supplies with a view to using some of them at long last. Hi – I’m working on some layouts from National Scrapbook Day, and some cards for my mom for Mother’s Day. I’m making her a set of cards with a box to hold them. Last night I finished up a baby album for my cousin who is having her first baby at the age of 48. Next on the list is to finish a family recipe album for my daughter’s first wedding anniversary next month (was suppose to be a bridal shower gift. Better late then never!). Then it will be time to start my own personal scrapbook albums. Planning on starting with my daughters birth and work forward. On my physical desk I’ve been mainly doing heat embossing on steampunk stamps. On my ‘virtual’ desk I also have been using lots of cogs and clocks but slightly softer kind of look over all. A huge mess from NSD. On my desk right now? A bunch of paperwork that needs to be filed. I digiscrap, so our shared desk in the den is where i do my scrapping. Right now I’m working on my Project Life album – finishing up journaling from last week. I’ve been really working on my collage notebook, trying to implement more creative scrap-techniques. My current project is a 50 page scrapbook of the recent visit of students from our Japanese sister city. My grandson and I hosted a middle school student from Takeo for two weeks. I prefer to design my own scrapbook pages and then have them printed by Photobook. I am working on the kids end of year class gift. I got a DSLR a few months ago and have to make time to read the manual and play with it so I can start recording memories! I can’t even see my desk, there’s so many unfinished projects on it: thank you cards, grad cards, art journal, and watercolor sketches. Lots of birthday cards! May and June are full of them for our family. Love to be a winner. I’m working on 2 different mini albums. One for my daughter’s birthday, & a Disney, Magic Kingdom, album. digital work. I am working on project life and photo a day. Thanks for the chance to win. Would love a MSC membership — thanks for the chance to win! I’m working on my day 8 layout for the LOAD513 Challenge with Lain Ehmann. Would love to win. Thanks for a chance. I currently have some just finished mothers day cards on my scrap table and some scraps that I will be using to make another mothers day card. I’m currently working on my Disney album for this year. I am behind on PL, but I’m determined to be up to date by the end of the week! lol..
A cricut, a printer a album in progress and my computer! Disney papers, alpha, and embellies. Several trips to scrap. I am in the middle of LOAD with Lain Ehman and so I have piles of pictures of my daughter waiting to be scrapped.Should have gotten organized before the month started. I am loving the Oomph and Polish issue as I just purchased a subscription!The amount and quality of content is amazing. Thank you! My area is a mess! I am making up page kits for a summer crop I will be attending. Congratulations and best wishes for many more great years. Thanks for the chance to win a fun prize. This is the busy time of year for me. hope to get some scrap-booking pages done next week. I have hundreds of new photos to scrap, having just returned from 2 weeks in China. My scrap desk has my PL book open to the week of St. Patrick’s Day with pictures and memorabilia to be added! Always a work in progress and that’s ok! I’m participating in LOAD this month so I still have lots of bits and pieces from daily LOs all over the table. A 2-page paper layout of my daughter’s violin concert from March 2012 using old and new paper and embellishments from my stash. I am still unzipping a ton of files from my many purchases last weekend. So that’s a big part of what I’m dealing with right now. I’m also working on a set of templates for a certain page format that I want to use in my family history album! Thanks for the chance! I’m working on my son’s baby book. He’s about to turn a year old and I want to get as much done before baby #2 arrives in a few weeks! My goal is to be finished with each boy’s first year book by the time they’re 18 months old. I am working on our first cruise. I have papers that I have been looking through for a mini album I’m working on. I am starting to back up all my digital scrapbooking stuff and photos to an external hard drive so I have more space to work on digital scrapbook pages- they take up so much room! I have a Design Team layout that is almost finished. Just waiting for some time to stitch on it. A messy pile of business cards, menus, tickets etc from a recent trip. time to get busy! A lot of multi medium stuff! Gesso, inka gold, mists, stencils galore, modelling paste! My Hawaiian Cruise scrapbook is on my desk – i really need to get it finished. I have week 15 & 16 of my Project Life sitting on my desk at the moment. just finishing a “secret gardens” graphic 45 photo collection that I learned how to do from Julie at the Sassy Scrapper in Murfreesboro. Also finishing a Recipe Portfolio that I designed using a presentation folder and designer paper. Both turned out really great. Can’t wait to show them off. I am working on a project for my fiance’s 40th birthday. Lots of photos and stuff on my desk. Right now on my desk is a two page layout of one of the three baby showers I had four years ago. It has 29 photos on it and four hidden journal cards containing (predictions, gifts received, my thoughts, and advice). It is amazing how much you can fit on two pages and it still looks good. 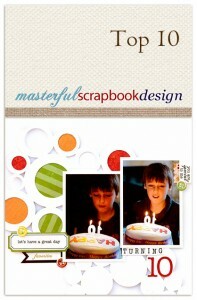 :) I am new to scrapbooking and have just recently found this website. I believe it will be a good addition to my scrapbook sessions. Thanks for all you gals do.